Miami is the world’s top cruise port for many reasons. Cruises from Miami are handled smoothly and efficiently every day. Thousands of arriving and departing passengers (and their luggage) glide smoothly to and from the ships and out to the nearby airports, hotelsand parking lots in a seamless process. Disclaimer: This article contains some affiliate links which we could earn a commission from. With its subtropical climate, convenient location, unique sights and excellent amenities and you will quickly understand why cruises from Miami port should be your first choice. Here’s why! Why settle for anything less than the best when planning your next cruise vacation? The Port of Miami currently has 8 passenger terminals serving 23 cruise lines berthing 55 ships, and this number increases every year. 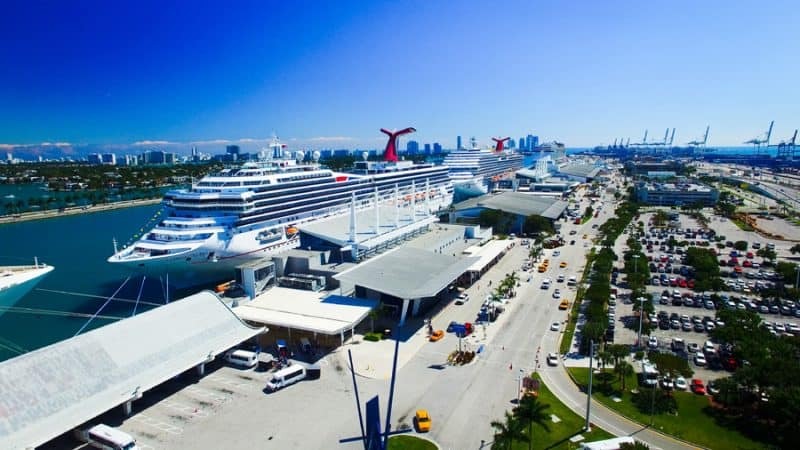 Not only does the Port of Miami provide the widest choice of cruise destinations, it also has modern purpose-built terminals to ensure your port arrival and departure is efficient and hassle-free. The newly renovated Terminal A can accommodate the new superships which reach up to 1300 feet in length. The striking design and architectural elements make the cruise port an iconic part of the Miami skyline. Miami cruise terminals all have plenty of seats in air-conditioned comfort as well as porters to help with luggage. Miami enjoys year-round sunshine so whatever time of year you choose to sail off into the blue, cruises from Miami guarantee a warm send-off for your Sail-Away Party on-deck. Even in the cooler winter months there’s no risk of the airport or port being closed due to snowfall or bad weather. It’s a definite plus! Why not add a few days to your Miami cruise by booking a Miami hotel and exploring the area? It’s a great opportunity to enjoy an exciting Everglades airboat experience. The Everglades National Park is a UNESCO World Heritage Site and the most famous of Florida’s 11 national parks. You can arrange an Everglades trip online or through your hotel if you wish. In less than 30 minutes you can be out on the “River of Grass”, a world away from Miami city vibe. Alternatively, spend a few days on the beach, shopping, dining and seeing the sights. You can visit Miami Zoo, Coral Castle, Fairchild Gardens and Viscaya Mansion or take a walking tour of South Beach as the perfect add-on experience to cruises from Miami. Cruises from Miami are very easy to get to. There are daily flights to Miami from most major cities in the USA, and internationally. The airport serves over 50 airlines which means that flights to Miami for cruisers are cheap and plentiful, especially if you book early. Miami International Airport (MIA) and Fort Lauderdale Airport (FLL) are both close to Miami (11 miles and 30 miles respectively). Even Orlando International Airport (MCO) is within 3 hours drive of the Port of Miami. Those preferring to drive to Miami will find plenty of car parking with free shuttle service to the cruise port of Miami. Read All You Need to Know About Miami Cruise Parking Here! If you fly into Miami Airport, you will need to arrange a transfer to the port for your cruise. Most cruise lines offer transportation by shuttle bus to and from the airport on the day of the cruise. As an alternative to the official cruise line shuttle service, there are independent shuttles that offer pre-booked transportation between Miami Airport and the Port of Miami. They tend to be cheaper than cruise lines and use minibuses to transport groups heading out on cruises from Miami. You can find the best rates for cheap Miami airport-to-cruise transport with companies such as GoAirportShuttle, SuperShuttle, and Port of Miami Shuttle. Read our full article about Getting from the Airport to Miami Cruise Port here! Seniors, disabled travelers and those with limited mobility will find the Miami cruise terminal very user-friendly. The port has a supply of wheelchairs for those cruising from Miami and can provide assistance when boarding the ship. Designated parking at the port is available for those with a disabled permit or license tag. It is free of charge for vehicles with specialized equipment or displaying a State of Florida license plate for disabled veterans. Check out the official Miami-Dade website for more information about disabled parking at the Port of Miami Cruise Terminal. If you need wheelchair assistance you should notify your cruise line ahead of time and they will make arrangements for special assistance. Some cruisers have a preferred cruise line while others choose cruises from Miami based on the itinerary and ports of call. Whether you want to take a Transatlantic voyage, cruise the Caribbean, explore the Bahamas or sail through the Panama Canal, cruises from Miami will have the perfect cruise for you. Cruises from Miami offer an unrivalled choice of destinations and ports of call. Popular cruise destinations include the Caribbean (east, west and south routes), along with Mexico, West Coast USA, Alaska and South America via the Panama Canal. From the Port of Miami the world’s your oyster! Most cruises from Miami last 7, 10 or 14 days but the port also serves the nearby islands of the Bahamas. Scattered across the blue Atlantic waters, this archipelago of islands is about 100-200 miles from Miami. It makes short-term cruises from Miami to the Bahamas very convenient and easy. Weekend cruises from Miami are usually for 3 or 4 nights (Thursday to Sunday) and tend to be party-oriented. Short cruises to the Bahamas are popular with younger, more budget-conscious cruisers. Ports of call include Nassau, Freeport, Great Stirrup Cay (privately owned by NCL), Coco Cay, Half Moon Cay (owned by Holland America) and Disney-owned Castaway Cay. These beautiful ports of call are ideal for taking snorkeling and diving trips, shopping at local markets and taking group tours to points of interest. Back on board, it’s one big party in the sun! If you are taking cruises from Miami, it is recommended that you arrive in the city at least 24 hours before the cruise. This helps avoid any last minute panic due to delays, flight cancelations or bad weather further north. Miami has a huge choice of hotels, from budget to world-class luxury hotels. Your cruise holiday from Miami starts early if you include a night or two in a hotel first. Choose a hotel in Miami near the cruise port for convenience. Many nearby hotels offer free shuttle transport to the cruise port making it very easy to get you and your luggage to the port hassle-free. Check out our article on 18 Hotels Near Miami Cruise Port with Shuttle Service to find the best deals. Don’t forget to have your camera/smartphone handy as you sail away. Cruises from Miami sail down Government Cut and around the southern tip of South Beach before hitting the open sea. It’s the perfect opportunity to take superb photos of the Miami skyline as you look back at downtown, South Beach and Miami Beach. Many cruises out of Miami port are round-trip cruises. This mean they depart and return to the same port so they are ideal for those who have a fear of flying. Whether you want to cruise to the Bahamas, Caribbean or the coast of South and Central America, there are plenty of cruises from Miami to book your dream itinerary. One of the best things about cruising from Miami is being able to spend time shopping before and/or after your cruise. Miami is a hot spot for shopping, from designer boutiques on Collins Ave to bargains at Sawgrass Mills. Sawgrass Mills alone has over 2 million square feet of retail space, second only to Aventura Mall just a taxi ride north of Miami. Go onspoil yourself. You’re on vacation! You can also choose from loads of Miami Souvenirs from Amazon right here. Extending your cruise with a few nights in Miami means you will have plenty of time to sample the unique Latino influence and culture. Head to Little Havana for delicious Cuban cuisine or enjoy the best breakfast on South Beach at the famous News Caf. There’s so much more to see and do when you choose to cruise from Miami! Miami is known for its amazing nightlife with many clubs, restaurants and bars around downtown Miami, South Beach and Miami Beach. Stay the night before your cruise in a hotel and plan a night of exotic cocktails, music and dancing. Start the evening with a stroll along Ocean Drive in South Beach. You’ll see many convertibles and sports cars cruising along the iconic beachfront collecting admiring glances and enjoying the breeze. Later, head to Lincoln Road or South Beach and join the non-stop party! As you sail out of the Port of Miami, the channel is lined with walkers, restaurant diners and people enjoying a day at the beach. Give them a cheery wave from the Promenade Deck. You can also wave to passengers on other cruise ships that are docked in port. It’s all part of the fun cruise experience. Miami cruises open up the Caribbean islands making it very easy to enjoy some exotic destinations. Many amazing ports of call are just one day’s sailing from the Port of Miami. Popular ports of call include Key West, Antigua, Nassau, Bermuda, Cozumel, Aruba, Bonaire, Curacao, Cayman Islands, Jamaica, Puerto Rico, St Lucia, St Maarten, US Virgin Islands and more. Seen anywhere you would like to visit? Check out Miami cruises and plan your escape! People joke that Miami is more Cuban than Cuba, but the reality is that when you depart on cruises from Miami all the signs and port information are in English. You can safely leave your phrase book behind as everyone you encounter during the embarkation and disembarkation process will speak American English. Of course, some cruise staff has additional language skills to help international cruisers, but generally English is the language of default. Miami has so many cruise ships departing each week and not all the cabins are booked. Last minute deals abound so why not check for last minute cruises from Miami and get yourself a bargain? Remember, most cruises usually include all meals, snacks, cabin accommodation and entertainment. Last minute cruises from Miami can be as cheap as $35 a day it’s almost cheaper than staying home! As you can see, cruises from Miami have so much more to offer than cruises departing from smaller ports such as Tampa and Port Everglades. Why not make your next cruise one to remember by following our tips for cruises from Miami. You’ll be so glad you did!